Submitted Medium Jane Mougey does a gallery style reading for those interested in communication with lost loved ones. It is often people’s differences that make them special and for Jane Mougey, of Sciotoville, the thing that makes her different from those around her is also the thing that gives her the ability to help others. Mougey is a medium who offers psychic readings, spiritual readings that help people find their path as well as communication with lost loved ones. She explained that she works with five spirit guides including one main guide. Mediums have always drawn attention from roles in horror movies where they communicate with a haunting spirit to television programs showing actual mediums like John Edwards and Theresa Caputo. Mougey says it is these people that finally gave her the courage to use her skills publicly. Public opinion really inhibited Mougey from reaching her potential for much of her life. Like all other psychics, Mougey said that she has met some skeptics. This has not always been her sentiment. She remembers when her children were young, she would give private readings in her home for $5, which all she thought her insights were worth at the time. “I didn’t believe in myself or that I was worthy of making any more money than that,” she explained. Overtime, her fee increased as a result of people refusing to pay such a small fee. Mougey stated that people kept paying her more and telling her she was worth more. Not only did she fail to see the value of her skills, she avoided talking about being a medium, even to those closest to her. “My children and ex-husband knew I did something, but they didn’t know what I did,” Mougey stated. Then, when watching John Edwards, she remembers thinking she could do everything he was doing. After her children had grown and she had divorced, Mougey became more curious about how she was able to communicate with spirits. In 2006, she went to a psychic fair in Cincinnati, where she saw a world-renowned psychic, who gave a demonstration. As she learned, Mougey became more excited about sharing her skills. “It was like a second part of me came alive,” Mougey explained. She then started attending United Spiritualists Christ Church in Cincinnati for approximately three years, where she studied mediumship. “I wanted to understand how I did what I did, so I could explain it to other people. If you can help other people understand, then they aren’t afraid,” Mougey commented. Of the five spirit guides Mougey works with, she says one talks to her nearly all the time. She has now learned to control her skill a little better, making it easier for her to choose when to communicate as well as when to not communicate. High energy environments can it make it more difficult to communicate, Mougey explained. So, she has learned through meditation to quiet her mind and raise or lower her energy levels as needed. Mougey said that though she had to really utilize meditation when she first started gaining control and understanding of her ability, but now it has become second nature, like developing a muscle memory. “After a while, it just becomes part of you,” she explained. She added that she has also learned to do things through symbols, like asking her spirit guide to give her specific cues by turning her or other items. In addition to spending years studying spiritualism, Mougey has also studied nearly all religions and belief systems (including idology, shamanism, Buddhism, Islam, and Christianity) in order to better relate and understand those who come to her seeking guidance. She has also practiced using tarot cards and stones but says she that would rather not use them simply because she does not need them. Mougey added that these are aids that help to quiet the mind and make people feel more comfortable, including the psychic. If she has a client that wishes for such readings, she offers them because she wants the client’s comfort to be a priority. In addition to offering readings, Mougey also teaches spiritualism. Her classes range from universal laws (understanding the vibrations, energy and connectivity with the universe) to communication with spirits. The classes are often taught out of her home. She offers both day and evening classes, so that she is available for those who are retired and free earlier as well as those who work and would need to come after. Mougey says there are benefits all the readings she offers. She enjoys being able to help someone who has lost a loved one. Often, they simply want to know that the person is okay and want to be able to give a final message. This can be so important for them to heal and move on with their lives. However, psychic readings can be equally helpful. “When somebody comes in and says, ‘I don’t know where I’m at in life, and I don’t know what I’m doing,’ and I can help them get on the right path, that help goes on throughout their life,” she stated. Mougey says she has no idea how many people she has helped. Just last week, seven people contacted her saying that she changed their life. “It’s as if I’m a counselor in a church, helping people,” Mougey explained. Once very active in church, Mougey says that she knows that may be a strange way to look at what she does, but she sees the roles as very similar. Mougey says that her abilities come through God, and it is through her Christian faith that she is not only able to speak with spirits but she is also kept safe. Though horror movies often show a medium coming to a haunted house to communicate with a malicious spirit, that is not what Mougey does. She says she has never experienced anything scary. In fact, she says that often negative things are drawn by negative energy. Mougey says that she has helped people to get rid of the negative forces in their lives, but she often finds out that is a more difficult task than just working with spirits. Mougey says those with dark forces in their lives must change their lives. They have to get rid of doubt, negative thinking and fear and bring in positivity in order to change their experiences in their environment. “Some people don’t like to heal,” she added. 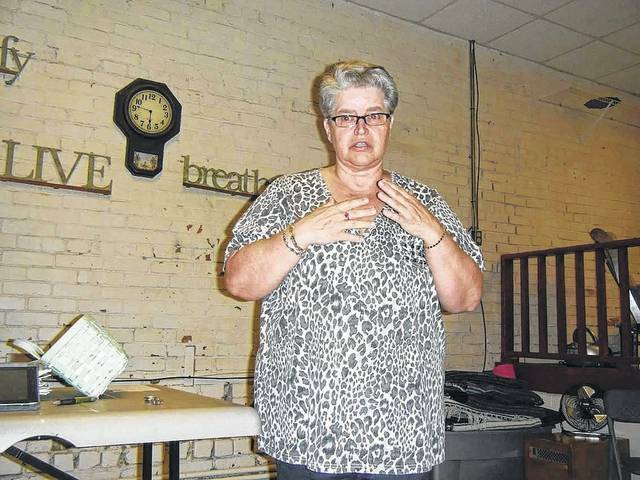 In addition to offering classes and readings in her home, Mougey says she also offers phone readings and some clients from around the nation that help her. She also does gallery type parties in private homes or as a guest for shops and events. For more information about her classes, readings or other upcoming events, reach Mougey on her Facebook page by searching Jane E. Mougey.